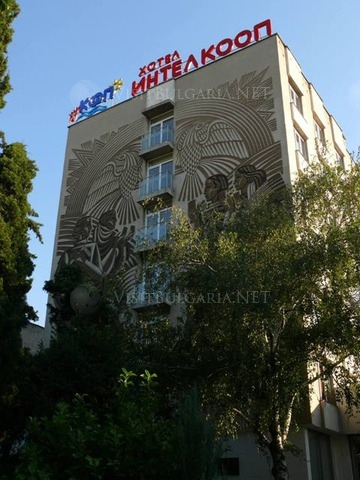 Location: Intelcoop Hotel is situated in the quiet central part of Plovdiv. The hotel is located in one of the most quiet and tranquil residential areas in the city of Plovdiv - Kyuchuck Paris, to the south of the central railway station and Rhodopi Bus Station. Accommodation: Intelcoop hotel offers 43 single rooms, 21 double rooms and 7 spacious apartments. All rooms offer an individual bathroom with a shower, wardrobe, telephone, TV set, internet connection and central air conditioning allowing individual adjustment of the room temperature. Wine & dine: Delicious dishes and refreshing drinks are served in the exquisite restaurant of the hotel. The restaurant hall has 120 seats and the terrace – 36. Conference centre: Intelcoop hotel offers 6 conference halls in a modern training centre. The halls offer modern equipment and functional furnishing allowing different types of arrangement and extreme flexibility compliant to the nature of the event and the number of participants.